Jetrike.Com - FWD or RWD? Front or Rear Wheel Drive? 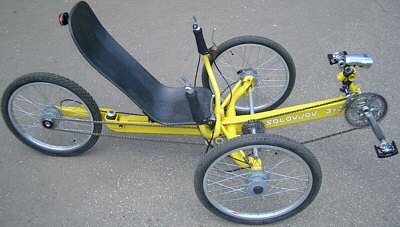 One of the many issues to consider when designing a recumbent, is whether to make it front or rear wheel drive (FWD or RWD). The choice is not clear cut. Each approach has its strengths and weeknesses, and like all good design, you have to find the best solution fit for your specific requirements. The above table attempts to compare the relative advantages and disadvantages of each approach, however these are generalizations, and the devil, as always, is in the details. First and foremost the significant limitation of FWD designs is their potential to loose traction on steep grades (hills). On level ground, the FWD recumbent should have more weight distributed to the front wheel than the rear. Ratios of 60:40 or higher are reccomended. The problem is that as the grade becomes steeper, the weight distribution changes to favor the rear wheel. The illustration above is extreme, and most riders even on hilly terrain don't consider FWD traction a significant issue. If however you are planning to ride off road, the friction coefficient of gravel, mud and dry grass is much less than tarmac, so traction will become a limiting factor. You can reduce the impact of grade on weight distribution by keeping the seat height low and increasing the wheelbase. One significant issue for FWD designs is the effect of trail on dynamic stability and pedal induced steering (PSI). To illustrate this, the diagram above represents the view looking down on a 20" front wheel that is moving forward down the page. It has a 75° pivot angle, 20mm of fork offset and is leaning 30° to the left. As the front wheel leans, the contact patch moves to the inside of the pivot axis. This is because the contact patch is moving around the outside wall of the tire. This causes the driving force (Red) to generate a turning force (Blue) around the pivot axis, but because the application of human power using pedals is not constant, the turning force oscillates. These oscillations will generate sympathetic harmonics at certain cadence frequencies due to the shifting weight of the legs while peddling, and their interaction with the dynamic tracking behavior of caster. On FWD twist chain designs, having a shallow pivot axis, short trail and long tiller minimizes the impact. On FWD moving BB designs however, the turning force will interact with the pedal force, alternating between cooperation and opposition. At some cadence frequencies this actually eliminates PSI effects and works well, at others, particularly high cadence it causes stability problems. In my experience chainline management is the single biggest issue in recumbent design. You can come up with a beautiful bike or trike, but if you can't transfer power efficiently form you feet to the drive wheel(s), then you will have to revise your design. The FWD moving BB design is used by the TT, Cruzbike, Speculoos, Python lowracer and Flevobike, as well as the Hipperion trike. When properly designed, pedal induced steering can be kept to a minimum. This is a challenging configuration, but in the case of the Python lowracer, it can produce a very light bike. The direct, unencumbered chainline is also the most efficient, the chain routing used in the other designs has been reported to consume over 5 watts. The FWD twist chain design has become extremely popular of late, particularly in the HPV racing scene. This design is favored by fully fared streamliners used in HPV speed trials because it helps to keep the frontal profile of the faring to a minimum. RWD is by far the oldest and most widely used chainline design. It is constrained by the seat height -- make the seat high and you can have an unencumbered chainline like the Cycloratio -- make the seat low and you have to route the chain over the front wheel and under the seat. For a tadpole trike this is less of an issue than for a bike, in that you only have to route the chain under the seat, but the front cross member and steering tie rods can also get in the way. One of the challenges all recumbent designs face, is making the distance from the seat the bottom bracket (BB-BOS) adjustable. It is often undesirable to make this adjustment by moving the seat backwards and forwards, because this may upset the ride quality and handling characteristics. Most designs incorporate some variant of a telescopic boom. However with most chainlines, this requires adding or removing chain links to make the adjustment, on the theory that once fitted to the rider, the BB-BOS distance never needs to change. If however you are planning to race in a 24 hour HPV event with a team of riders, quick changeovers are a requirement. The FWD moving BB design is rather unique in this regard, the bottom bracket can be design for adjustment without any need to modify the chain. The alternative for routed chain lines is to have a longer chain and use an adjustable chain tensioner on the return run. The angle between the direction a wheel is pointing and the path along which it actually moves is called the slip angle. Slip occurs under power when a trike is turning. It also occurs under breaking as the tire approaches its traction limit. Under power the weight distribution usually moves to the rear of a vehicle, but human power being as limited as it is, acceleration forces are rarely an issue, unless you ride a unicycle. Under breaking the weight distribution moves to the front outside wheel. How the steering behaves under power is dependent on the weight distribution and the friction coefficient of the tire and road surface. Steering behavior becomes more pronounced when the friction coefficient is low i.e. a verge with loose gravel while cornering. Too much weight at the rear causes the rear to spin out (oversteer). Too much weight at the front causes the front wheels to plough (understeer). Neutral handling is when the weight is evenly distributed between the front and rear, but generally slight understeer is considered safest. RWD trikes have a tendency to understeer. This is because the drive force is pushing the trike forward in a straight line, and the front wheels slip forward as they turn. It is only the friction of the front wheels on the pavement, not the driving force that turns the trike. The location of the optimal CoG also creates a weight distribution that favors understeer. Under the decelerating forces of braking the steering behavior may be completely different. It is dependent on the dynamic weight distribution, which is directly influenced by the location of the rider CoG in relation to the front contact patches, the seat height, the brake force distribution, and the amount of brake force applied. FWD trikes have a tendency to oversteer. The drivetrain pulls the front of the trike around the corner. It is only the friction of the rear wheels on the pavement that prevents the rear of the trike from spinning out. However because the weight distribution is already biased towards the front wheel to improve traction, these forces tend to cancel one another out. In competitive racing, particularly on short tracks with lots of cornering, riders may prefur the responsive feel of slight oversteer, but it carries the added risk that the rider may loose control. Too much oversteer will make a trike unstable and dangerous. I have confirmed this behavior with Jetrike. When turning sharply enough on gravel so all three wheels drift, the trike is generally well balanced, if however traction is completely lost, oversteer combined and an abrupt loss of momentum is the frequent result, but being a trike, easy to recover from. The S-4 trike pictured above, features all wheel drive (3 x 3), which would actually come in handy on icy winter roads. It all comes down to what your requirements are. For most trikes the critical safety issue is how well it handles under extreme breaking and cornering conditions, and that is all about the location of the rider CoG and weight distribution.